As you may have read, this site is dedicated to thinking for yourself. Ideally, this would mean presenting you facts you could check for yourself. In the case of a not-yet-existing-nuclear-reactor, this goal is over-ambitious. A more realistic goal is to try to clear up some confusion. An operating LFTR consists of a vessel, filled with hot, molten fuel salt. In this melt, a nuclear reaction takes place: the conceived LFTR burns 233-Uranium in a special mixture of salts. This part, the fission of U233 in a vessel full of molten salt, is what has been tested in Oak Ridge during the MSRE. It worked fine, the reactor operated flawlessly in those four and a half years. Even though the reactor was small (around 8MW of thermal power, no electrical turbines connected) the importance of this fact can hardly be overestimated. It simply means that the principle works. And yes, there were some issues with the structural materials, but these were solved, already in the early 70s in subsequent research, making use of materials science of those days. In the present time, the materials science has advanced by decades of development. Developing a new generation of MSR’s will be a technical challenge, but one that can be met. A next step in the research, one that was planned by the researchers of Oak Ridge but did not take place, was the addition of a second layer of molten salt around the core. This ‘blanket’ contained its own mixture of salts with thorium as its most notable element. Natural 232-thorium does not fission but it can catch a neutron and becomes 233-thorium. This decays into Protactinium, which in turn decays into 233-Uranium, which can fission. This is the reason the thorium is there in the blanket: it is fertile. Meaning: new uranium can be made out of it. This means that LFTR taps into the vast supply of energy called thorium. In the earth crust, thorium is about as abundant as lead. And with the route sketched, a single metric ton of thorium is enough to deliver about one GWYe of energy – enough to power the city of Amsterdam for about a year. Which in turn means we have enough affordable thorium to power the planet for tens of thousands of years. On the question of how many years, different numbers are in circulation. In due time, this site will provide some calculations that explain these different numbers. Critics that state that ‘thorium is a hype because the MSR used uranium, not thorium’ have a point in the sense that the term LFTR may be slightly confusing: it is uranium that fissions, not thorium. However, it is hard to see why this would deny the viability of the concept in any way. LFTR does not only have its own online fan community, it also has an informative page in Wikipedia. This page offers an informative discussion of its potential and its hurdles. There is little added value in repeating this page here, so we will limit our technical discussion to some of the more striking technical aspects. Inherent safety: LFTR has a negative temperature coefficient. Simply put, this means the hotter the core becomes, the less efficient the nuclear reaction will be. This prevents it from the so called ‘power excursions’ – the dread of any nuclear engineer. Low pressure operation. The molten salt needs no pressurizing to keep it in the reactor vessel. No pressure means there is nothing that can explode, and no ultra-strong buildings are needed to keep everything safely inside. No melt-downs are possible. 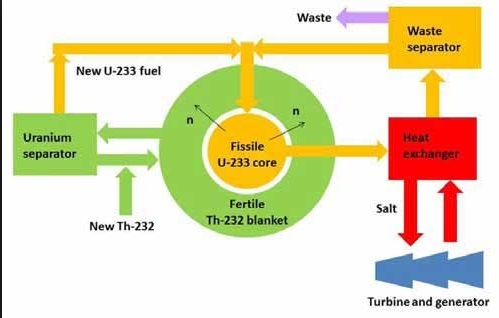 Unlike in a conventional reactor, the fuel is already molten and safely contained. If, for whatever reason, the reactor loses power for control, a simple ‘freeze plug’ melts and the fuel melt will drain safely into subcritical storage tanks – the decay heat of fission products will be dispersed by natural convection. Less long lived waste. LFTR produce very little of the transuranic waste that conventional reactors produce. The small fraction of waste that is being produced does not need stored for ten thousands of years, but for about 300 years – after which it is less radioactive than natural uranium. 4,166,000 tons of black coal is roughly the equivalent of 365 kilometers of train wagons, filled with coal. Interesting detail: in the ashes of this amount of coal is enough thorium to power a LFTR for ten years. And enough uranium for another eight years.